Ideal for most general purpose situations, the 9500+ series of pulse generators is available with 2, 4 or 8 independent outputs for synchronizing multiple events. 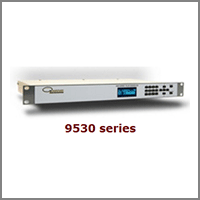 The 9500+ series is completely capable of generating multiple pulses and triggers for all applications, no matter how simple or complex they may be and is ready to operate out of the box. Flexible operating modes allow complete control of pulse outputs, including continuous, duty cycle, burst and single shot with external trigger/gate inputs. Advanced features such as Multiplexing allow the timing of all or several channels to be combined to form complex pulse patterns. For automated test equipment, complete control of the instrument is provided through the standard RS232, USB and GPIB Interface – Ethernet is optional. 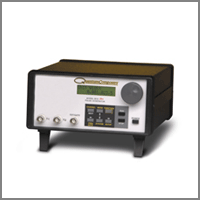 Quantum Composers offers the Model 9520 Pulse Generator as a cost effective instrument that provides solutions to generate and synchronize multiple pulses and triggers for a wide variety of applications. 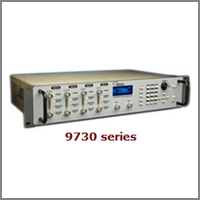 The 9520 Series is the only multi-channel pulse generator to permit differing rates for all the channels using new Clock-Divider functions, and provides up to eight independent digitally controlled channels with width, delay, rate, and amplitude control on each output. The 9520 Series Pulse Generator now offers dual inputs, functioning as dual triggers or trigger/gating through BNC or optical connections. This is particularly important to stop continuous pulsing with a secondary trigger signal. The user also has per channel source options and can keep specific channels free-running and other channels triggered. 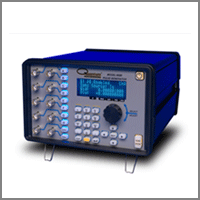 Quantum Composers Model 9530 Digital Delay/Pulse Generator represents the latest in timing and synchronizing capabilities. This is the most innovative instrument to accurately synchronize laser system timing or any series of experimental events. T This allows the user to use the photodiode signal directly from the laser and phase-lock all of the system timing relative to the laser frequency with low jitter. The 9530 provides complete independent programming including precise widths and delays out of each channel. Other key features that distinguish the Model 9530 digital delay/pulse generator include remote programmability – RS232, USB and Ethernet, Internal rate generator – 10ns period resolution over entire 20 MHz frequency range, 8 independent outputs, dual inputs (gate and/or trigger), and complete channel and system setup stored in memory. 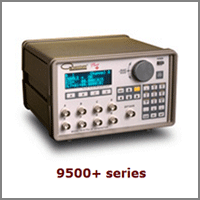 The Model 9600+ Series is available with with 2, 4 or 8 independent outputs and is our most affordable digital delay/pulse generator. This unit is ideal for applications that require moderate precision and multi-channel capability. Despite its low cost, this robust model offers a full suite of features making it ideally suited for the budget sensitive user.The delay and pulse width for each channel are independently controlled at 10 ns resolution with 2-20 volt output range, allowing the user to drive a wide range of load circuitry. This pulse generator offers several operating modes (continuous, burst, single shot and external trigger/gate) allowing complete control of the pulse outputs. The 9730 comes in a 2 or 4 channel model with current sensing and resistance measurement capabilities. The ability to generate highly precise current pulses makes this unit ideal for applications that require a high level of accuracy and repeatability. The 9730 also comes with advanced safety and testing capabilities that include remote interlock, pre and post measurements and keyed enable switch. All of these features assure that the unit fires only when all safety criteria are met.